Using data and graphics, The Innova Group helped the Veteran’s Health Administration rethink their service delivery model and create a new framework that provides a logical approach to prioritize capital investment. To correct resource-to-patient population mismatches, improve poor access, and better connect strategy with capital investment, the Veterans Health Administration (VHA) engaged The Innova Group, and two partnering architecture firms, to complete an integrated health services and facility master plan pilot project that would become the foundation of the new planning process for all Veterans Integrated Service Networks (VISN). 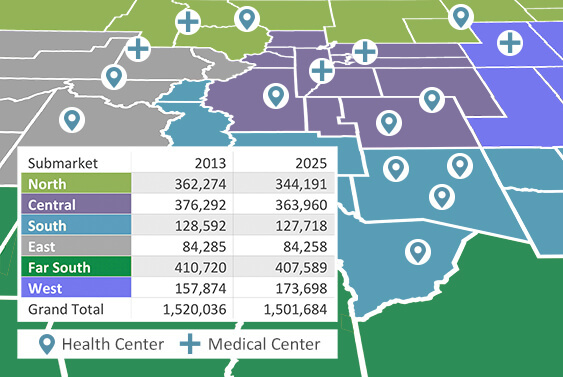 As envisioned in the pilot, the new Integrated Planning (IP) process uses data and graphics to analyze and document 12-year projected Health Service Delivery Plans for each multi-state VISN. It transforms the historical, reactionary analysis to a proactive creation of VHA Service Areas. The Service Delivery Planning effort includes an evaluation of the VISN existing service delivery model, development of an Ideal Service Delivery Model, and a synthesis of existing with ideal resulting in an optimal delivery model. The Service Delivery Plan establishes a framework for primary care service areas, for a variety of delivery mechanism (contracted or direct care) and facility types, dependent on local populations, referral patterns and availability of alternative care. Overlaying the Service Delivery Plan with the existing infrastructure, illustrates the gap between the optimum and the existing health system. Integrating service delivery with facility master planning has become the standard for VISN medical center planning; driving facility priorities and informing capital investments and non-capital recommendations.